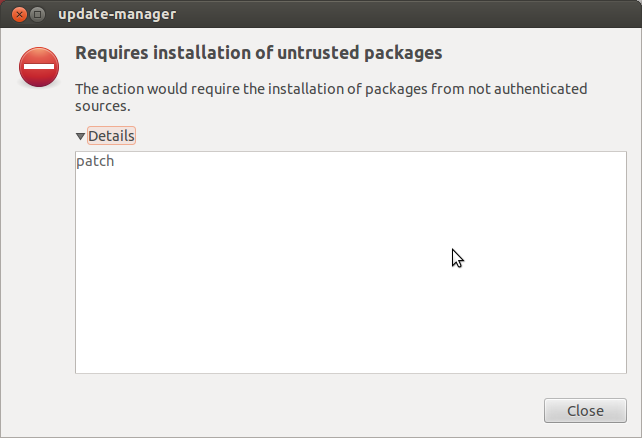 Requires installation of untrusted packages? This will rebuild the cache. This link may help. It addresses a very similar problem. Basically, you open a terminal and type sudo apt-get update && sudo apt-get upgrade. That did it for me. The accepted answer didn't help me in my case (Ubuntu 13.10) but I was able to get around the problem updating through the command line instead of through Software Updater (in case anyone else runs into this problem). presented me with the particular package that was coming from an untrusted source (Google's Music Manager) and asked if I wanted to accept it and upgrade. I had the exact same error while trying to update System Indicator. In my case it was because of missing GPG keys. There is an answer here that will instruct you to install a PPA manager and it can attempt to import all the missing keys. I did this and it didn't give me any confirmation the missing keys were imported but I ran the update afterwards and it installed fine. It is a horrible (non-useful) error message I must say in this case. Why am I unable to update from Software Updater? How do I enable the “Universe” repository from the command line? How do I get security updates for restricted/partner packages?